Wines of Argentina, the institution responsible for the worldwide promotion of the brand “Vino Argentino", has presented its 2017 harvest report, based on contributions from renowned specialists, winery representatives and those connected to the wine sector. 2017 will be a year remembered for the exceptional quality of its wines. This can be explained by very low yields and very high grape prices. Good thermal amplitude favoured the veraison and maturity of the fruits, enhancing the quality of the harvest and resulting in good development of all varieties which was reminiscent of the best years. Sprouting was good to very good (above 85%) with significant vegetative growth thanks to the abundance of water and few extreme temperatures. The unusual characteristics of the year, lower yields, excellent maturity, few climatic accidents and optimum health led to wines with lower alcohol and better acidity. The reds stand out for their remarkable aromas, colour and presence of tannins, which ensures optimal ageing potential. The whites, on the other hand, surprised with their freshness, notable tipicity and aromatic expression. In terms of varieties, the Malbec in Cafayate, La Rioja and Mendoza all stood out; the Sauvignon Blanc in Chubut, La Rioja and Chapadmalal and the Torrontés in Salta and La Rioja. The total amount of grapes harvested in the country was 1.9 billionkilograms, which produced just overa billionlitres of wine. 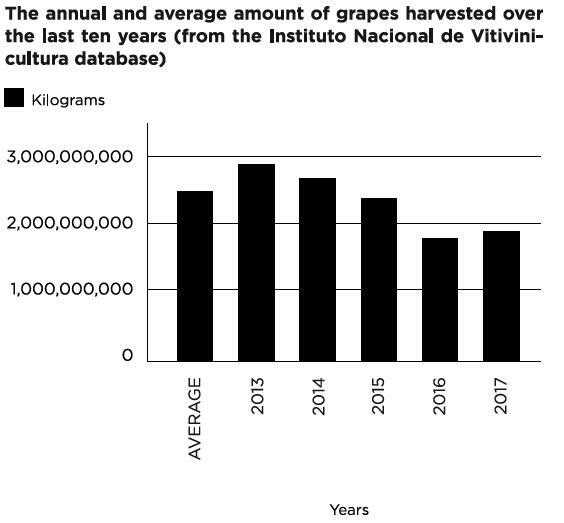 This figure is an increase of 175 million kilos in comparison to 2016, but was lower than that of the 2015 harvest and the historical average (covering the last 10 years) which was 2,554,758,443 kilograms. 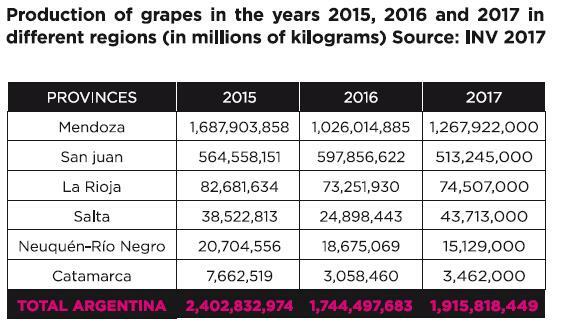 The decrease of harvested grapes occurred in all regions except Salta, where it almost doubled. Alberto Arizu, president of Wines of Argentina, said: "In the 2016/2017 season, rainfall were slightly above the historical average, butwas lower for the summer months, which resulted in very healthy grapes. For this reason we are satisfied with all the work done and especially with the quality obtained during the 2017 harvest".